Tone 3 is the first day of Movement. An Intention takes on its own life as a vibration through the action of movement or communication. What we do or say to act on our Intention initiates a Movement of Spirit. Road/EB is the Day Sign of Human and the Road of our Destiny. Human’s destiny is our journey through life. Our Choice for Creation was inspired by the Monkey, who sees Life full of beauty and curiosities. Monkey is said to never finish, but Creates what it Loves in the Moment. Human is the “bearer of time and conductor of destiny.” What we create is our Choice alone to make. We are only capable of Creating Love by our Divine Nature. We set the Power of our Spirit forward through movement and breath. We create a vibration of energy that begins its own movement. This is the day for a Leap of Faith into a new way of Being, to experience the Reality of bringing Love to Earth. The glyph illustrates the road on Human’s head. The dots on either side are the milestones of a journey. The Tzolk’in is the Calendar of the Human that marks the path to our Transformation. The Tzolk’in marks our Experience of Transformation from our beginning to our end. Human was born to manifest a Dream of Divine Love. Our first sign of life was the sound and movement of a beating heart. The Creator intended Love to be the experience from which we would draw our first Wisdom. Born Creators, Creating Love is our Meaning and Purpose. Through the Choice, we can realize our Divine Nature, and Love as our Power of Creation. Road/EB is Human’s Sacred Path, that by our own Choice will lead us to our Divine Destiny. We have to bear the time, but the Choice is the Covenant for our own Divine Justice. The Cherokee Day Sign the Rattlesnake Tooth is symbolized by a rainbow, a spectrum of color displayed by the electromagnetic rays of the Sun. The rainbow symbolizes an ethereal connection between the above and below that Human eyes are capable to see. So was the Rattlesnake Tooth used to leave visible evidence of the touch of the Creator’s hand. Rattlesnake Tooth is the natal Day Sign of Medicine, the Shaman, the Priest, and the Healer. In the ceremony of healing, the shaman used the Rattlesnake Tooth to break the skin to leave the mark of a Spiritual Healing. Living close to the ground, snake is a totem of life force and primal energy. Snake is a symbol of Enlightenment and the Illumination of our Divine Nature. Human’s cycle of Major Transformation is 260 days, compared to the harvest of the Corn. Science tells us that the human gestation cycle is 280 days. I guess I can be a stickler for details, but this discrepancy has floated in the back of my mind since my introduction to the calendar. 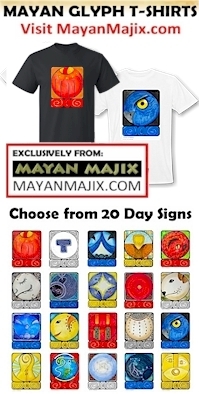 The 260 days of the Tzolk’in mark major revelations of Human transformation, the sum of 4 Human seasons of change. The 9th uinal will complete this “Human Spring” and the major transformations of reproduction and multiplication. Conception and Reproduction are among the greatest transformations that we see in Human. We are counting down the Days till the birth of a new Identity, a Major Change in how we perceive our Self and the Beginning of a new experience of Life. Road/EB asks us to set the milestone so we can see our progress. We will realize the Light we’ve created by remembering where we started. Our incremental steps of growth are hard to see in the moment. Paying attention to Time, our unseen growth becomes visible, even to Human eyes. Love holds the highest power for Transformation. Under a trecena led by Dog/OC, we can expect a major transformation of our Love. The degree of darkness we experience will be equal and opposite to the Light of our transformation. Creating new Inner Strength requires us to push beyond our old limits. The 9th uinal encourages our patience to see the bigger picture. The 9th uinal is guided under the direction of the God of Light, Quetzalcoatl/Kukulkan, the Light that descends from the Above to the Below along the stairs of the calendar pyramid of Chichen Itza. 9 can break through the illusion of separation with the help of Divine Intervention. We can take a new Leap of Faith to Believe in a Power Greater than our own for a Major Transformation Created by Love. To all my relations, may we Acknowledge our own Season of Waiting for the Birth of a Miracle. May we willingly move forward into the darkness of our Unknown. May we move forward with a sense of curiosity, just as a new mother is drawn to keep track of the unseen process happening inside. May we recognize the birth of new Life as the Miracle that is manifested from an Intention of Love. May we see that birth is a Divine Process completed by the Creator’s Hand, initiated by Human’s Intention to Love. REMEMBERING THOSE IN THE PATH OF HURRICANE FLORENCE. I’m grateful that Human’s first step of Intention is the only step we have to make alone. Visit the 13-Day Trecena Guide for daily aspects and events of the DOG/OC trecena. Galactic Tone 3: Movement. Three is basic movement and communication, which begins as a vibration. Three energy is very eloquent in all types of self-expression. Communication is how Three establishes a point of agreement between any point “A” and any point “B”. Three persons are rythmic to the core and are often restless, as motion is their nature. By working closely with the energy of Three, any person becomes more able to predict motions of all kinds. Road/EB: The bearer of time and conductor of destiny; also known as Human; these persons open the road and guide to the future groups, communities and individuals alike. Likable, obedient, dedicated hard workers and organizers, Road persons are fortunate in business and travel. Many become care takers of the poor, sick, or old people, where they may make personal sacrifices. Sometimes referred to as the sign of Grass, which is the most bountiful of all life forms, but is also the most humble. Road persons are affectionate and emphatic; they are easily hurt but slow to anger. Holding in of negative emotions and unexpressed resentment can lead to illness, a poisoned opinion of others and a false bravado for this sun sign. Cherokee, Rattlesnake Tooth: Symbol is Rainbow, a delicate display of electromagnetic rays of the SUN. The Natal day sign of Medicine, the Shaman, the Priest, the Healer, and the Sorcerer; Guardian of the Way, Keeper of the Keys of the secret Kingdom. I received my new passport! My Leap of Faith to buy the ticket before receiving it paid off. 🙂 The reality is starting to set in. I’m excited to carry you with me. My 68th gregorian birthday is this week. I know what a healing it will be to see I’m just as capable as I have always been to charge off into the unknown for the experience. (Monkey must be talking.) I couldn’t be doing this without you.